League managers pose after enjoying best-seats-ever at Saturday’s Astros-Nationals game. Pink-shorts girl is photo-bombing us. But must we turn everything into a debate? Hickory will be on the clock at 6 p.m. sharp, and the Nuts will be picking both first and third, following a recent trade with Destin that shipped Evan Longoria to the Beach Bums. In-between, the resurgent South Grand Prairie Warriors will pick second. Pre-draft prattle has a general consensus on top players to be selected including Jose Fernandez, Yasiel Puig, Will Myers and Josh Donaldson. Some managers also favor Gerrit Cole; others like Shelby Miller. And Xander Bogaerts is in the mix too. It all plays out Saturday night with 10 managers drafting in person and five drafting remotely. 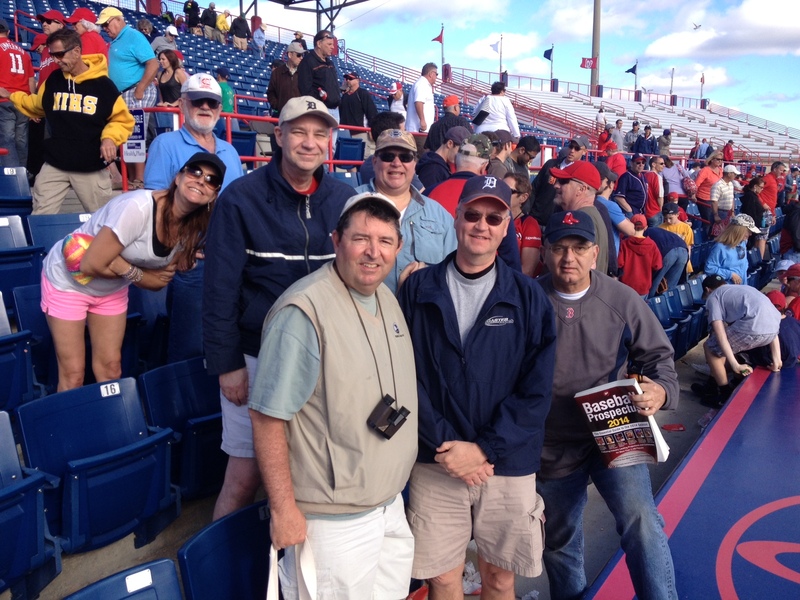 Many hours of preparation have already been devoted to this year’s draft, including eyewitness scouting at Nationals-Braves and Astros-Nationals games — where on Friday we landed perhaps the best spring training seats in the history of I-75 League spring training games. Other early topics of discussion include a prediction of 105 wins for Savannah (from Gary, not Steve), admiration for the beastly Chatfield lineup, and an educational exercise of a three-round simulation draft conducted Friday night among the managers who were already present. There’s one more ballgame on tap before the draft — Mets at Tigers in Lakeland, then it’s time to get busy. Managers who are drafting remotely, make sure you have access to the draft grid, as that is the document we will be adding live picks to during the draft. Moderator: Former league manager Ken Kuzdak. Also in attendance will be Keith Gergel, son of Destin manager Mark Gergel . Maybe Springfield manager Dave LaMont will give us a shoutout during his broadcast of Saturday’s Mississippi-Vanderbilt game on ESPN3 (2:30 ET).